On 6 March, lawyer Elchin Sadigov met with arrested blogger Mehman Huseynov in Detention Centre #2 located in Shuvalan settlement of Baku. According to his lawyer, Mehman is in good spirits. “Mehman has already been placed in his cell. He shares a cell with four other people. The cell is not cramped. He is satisfied with the conditions. There is a WC and TV set in the cell and he can watch national TV channels. He did not complain of the way he was treated in the detention centre, either,” the lawyer said and added that Mehman sent greetings to his friends and asked them not to grieve over his arrest. Mehman asked his friends to send him books to read. According to the lawyer, Mehman Huseynov’s jail sentence has been disputed by a 23-page appeal which covers all details and seeks Mehman Huseynov’s acquittal. Recall that, IRFS chairman, and prominent blogger Mehman Huseynov was sentenced to 2 years in jail by Surakhani District Court’s judgment of 3 March 2017. He was convicted under Article 147.2 (libel, involving an accusation of a serious or particularly serious crime) of the Criminal Code based on the private prosecution complaint of Nasimi District Police Department chief Musa Musayev. Mehman Huseynov was detained by officers of Nasimi District Police Department in the evening hours on 9 January. He was released after being convicted under Article 535.1 (disobedience to lawful requirements of police) of the Administrative Offences Code and fined AZN 200 by Nasimi District Court. 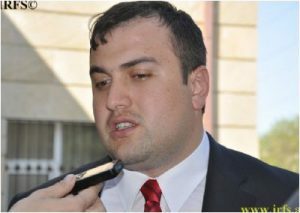 Speaking to journalists after leaving the court building, Huseynov said he was facing the pressure due to his professional activities and had been tortured by the police during his detention. The Ministry of Internal Affairs (MIA) denied the blogger’s claims and called his allegations libel. The Ministry’s statement also read that the MIA had submitted a petition to the Prosecutor General’s Office for a legal assessment of Mehman Huseynov’s slanderous accusations against the police incriminating them of a serious crime. After that, Nasimi District Police Department chief Musa Musayev filed a private prosecution with the court. The police chief asked the court to bring Mehman Huseynov to justice under Article 147.2 (libel, involving an accusation of a serious or particularly serious crime) of the Criminal Code. The court completed the proceedings within one hearing and issued the judgment without giving sufficient time to the defence to argue against the lawsuit. Mehman Huseynov was convicted without having an identity card or citizenship passport. He has been banned from leaving the country for the last five years. Mehman Huseynov himself, his lawyer and international organisations have declared that his arrest is politically motivated and is associated with his blogging activities. Huseynov’s arrest has drawn widespread objections in Azerbaijan from political parties unsympathetic to the government, activists and social network users. On 4 March, broad hearings were held in Baku demanding Mehman Huseynov’s release. Following the IRFS chairman’s arrest, 24 influential international organisations severely condemned the Azerbaijani authorities for the recent crackdown on free speech and freedom of expression in the country. been making videos on important socio-political processes taking place in the country. Huseynov’s latest video was a street poll on first lady Mehriban Aliyeva’s appointment as first vice president by President Ilham Aliyev. The question he asked to the respondents was ‘would you give your wife a post, if you were in charge’.